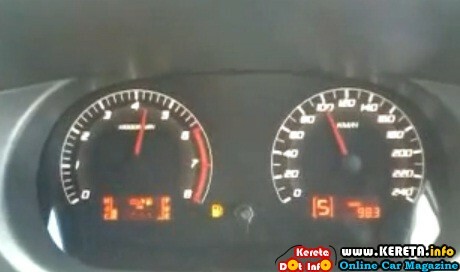 Here we share the acceleration test done by KDI for Exora CFE turbo 1.6 with CVT gearbox and Exora CPS 1.6 manual. The results of 0-100km/h test is between 13-14 seconds. Quite hard to get exact numbers for Exora CPS manual due to the slightly hard gear changing needed but for Exora Turbo with CFE and CVT, you don’t really feels it accelerate and feel less pickup but it is actually have good acceleration and the result is, it is faster than Exora manual 1.6 CPS. There are a lot of improvements from Exora CPS to Exora CFE. Especially the engine, the ride the exterior and the interior. Acceleration from 0-100km/h, we nearly does not feel any acceleration due to the efficiency of CVT gearbox adjusting the gear to the most optimum power output at the same time gives a very comfortable and smooth ride. A far and a lot better than most of cars under RM100k in terms of comfortable ride. The CFE 1.6 litre turbocharged engine produces very nice turbo sounds and you can hear it at around 80km/h and the power kicks in at near 2000RPM. But the ECU limits the RPM at around RPM5000+ to take care of the CVT gearbox from a hard acceleration and to prevent any engine damage due to high boost of turbocharged. Different with 1.6 CPS manual where you can hit the pedal up to 7400 RPM very high rev and you can really feel the acceleration. The fuel consumption of Exora manual is around 9L/100km while it is stated at the odometer of Exora CFE around 12L/100km and this may be due to the hard drive by customer who test drove the car. According to the spec, it can give around 7L/100km which is very fuel efficient for that big size of MPV which produce a good torque curves of 205Nm. It depends on how you drive it, you can save fuel via light foot drive mode or you can get the maximum power anytime you want by just hitting the pedal.